Disclaimer: The author doesn't take any responsibilities for damaging the synth or hurting yourself in any way. It is an electric device! 1 Disconnect the synth from the power. Power cable (please don't cut it away!). 3 Remove everything on top of the synthesizer. 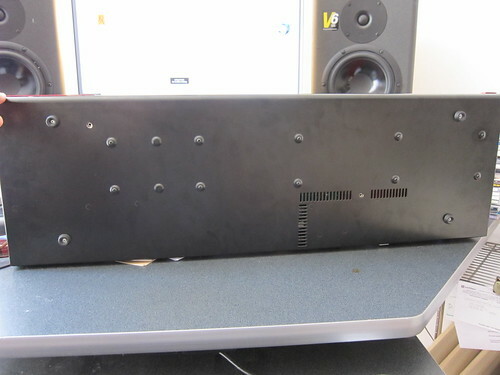 * the two screws at the front of the sides and only loosen the two with the washer (see picture) and leave these in place: they keep the hood fixed to the bottom of the synth, so you don't have to disconnect any inside cables! Screw at the back of the side panel. 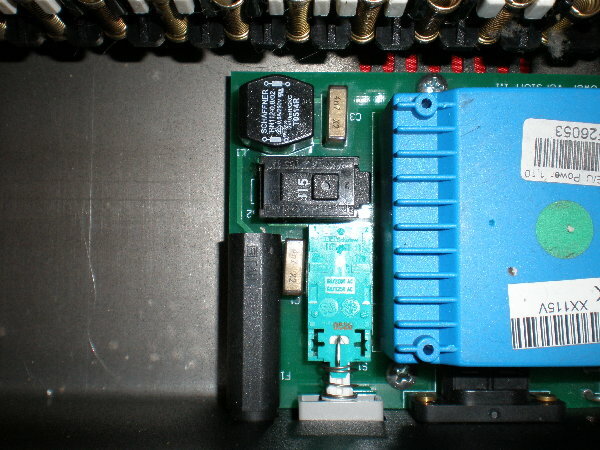 In the picture one can see the connection labelled 110-220-110. 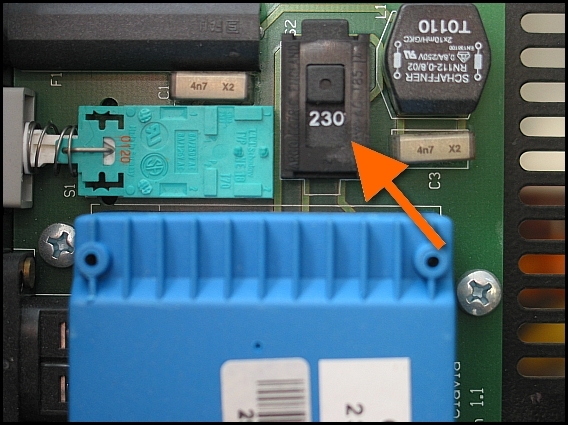 If the two inner side solder points are connected, the synth uses 220V (230V) , as in the picture. If the other connection is made, the synth uses 110V. 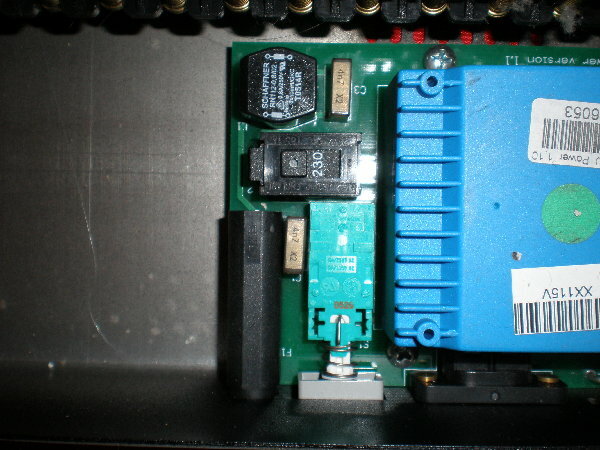 (See the scheme) To make it usable to 110V, remove the connection and make (solder) the connection outmost left to the inner left and inner right to the outmost right. (See picture) Beware! Both 110 connections have to be made in the 110 configuration! Of course to make a 110V synth working on 220V do it the other way around. You probably see the switch marked 230 or 115! Just switch this to the right value (or not if is already in the right position) and read the next posts!!! Close the synth again and replace all screws, doing the two at the bottom at last, of course! The fuse has to be changed too. What are we talking about...? When your power cord doesn't fit the wall connector, maybe conversions plugs can help. These are mostly available in any 'radio-shack' and the good camping equipment stores. Beware, these plugs are mostly not grounded! 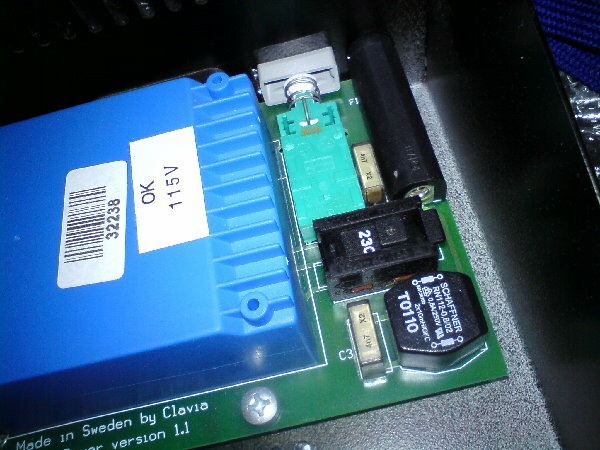 (See picture) These ones allow to plug in the European (Clavia) connector into another standard, so you don't have to change the cord. I use these when gigging abroad. Thanks Wout for detailing the process for Nord Lead/Wave. I recently bought a U.S. Nord Electro 2 for use in Ireland, so a voltage conversion was required (115V to 230V). Rather than shell out €45+ for an adaptor/transformer, I used the above tutorial, and the whole process cost less than €5. In case anyone was wondering how to do the same, here's the 115V to 230V process in detail for the Nord Electro 2 - 73 key. Usual caveat applies: This worked for me. If it doesn't work for you, I am not responsible. 2. 1 x U.S.-to-U.K. travel adaptor, or, if you know what you're doing, a U.K. plug. 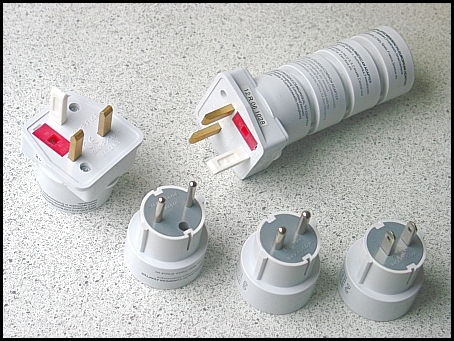 Incidentally, if you live in Europe, this process is exactly the same, you just need a different plug at the end. 3. Tools - phillips and flat-head screwdriver. Wire cutters/strippers optional. Set the keyboard up on a stand, allowing access to the back and underside. 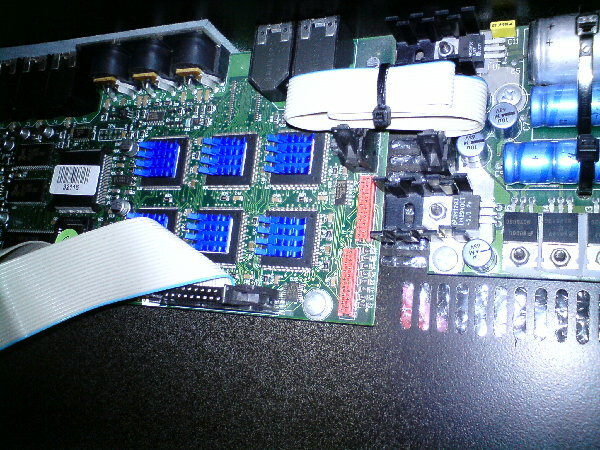 Remove the 9 screws along the edges (pictured). Remove the 2 remaining screws underneath (not pictured). These are the only two screws not in line with others. Take care not to damage the screw heads. Carefully raise the top of the keyboard, holding at the sides. Pivot as if hinged at the back of the board. Special care should be taken not to damage the ribbon cable connecting the cover to the circuits inside. 11 screws total - all Phillips head. 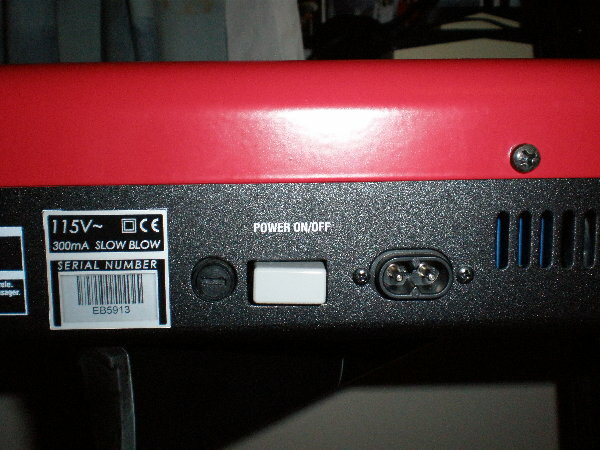 Locate the fuse holder on the back of the keyboard, just left of the power switch - see picture. 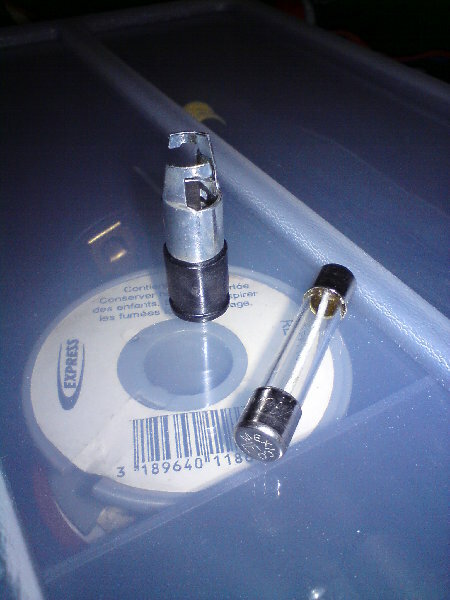 Using a flat head screwdriver, gently open the fuse holder: a fraction of a turn should release the holder, which can then be removed. 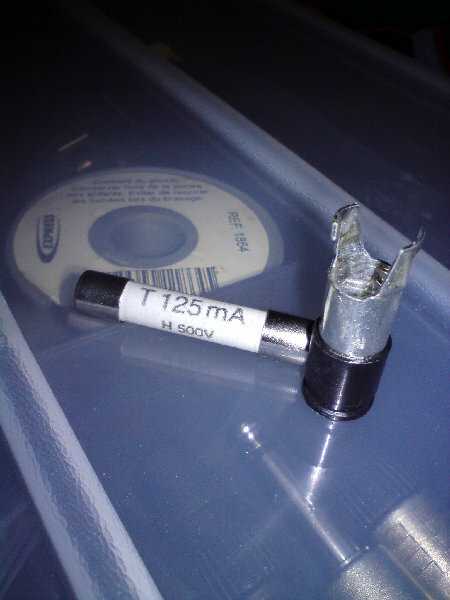 For this conversion (115V to 230V) the old fuse (250mA) must be replaced with one rated for half the current (125mA). 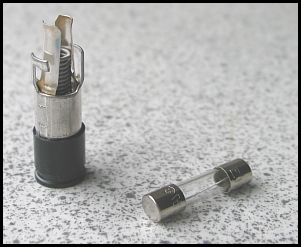 The Electro 2 takes 1¼" (31mm) fuses, see picture below. I had trouble locating the fuses, so I had to order online, leaving me with 9 more than I needed . If you have the same trouble, pm me and I'll post you one. And it may seem stupid, but glass fuses will break if you're careless. 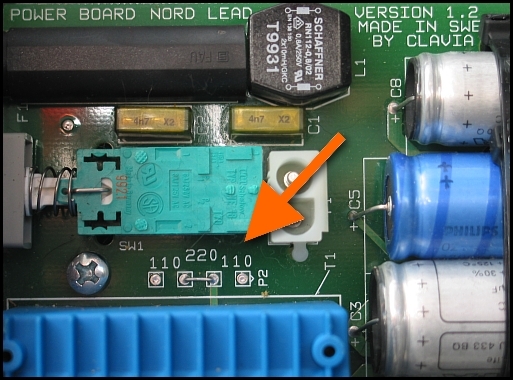 Anyway, replace your fuse and you're ready to switch voltages inside the board. 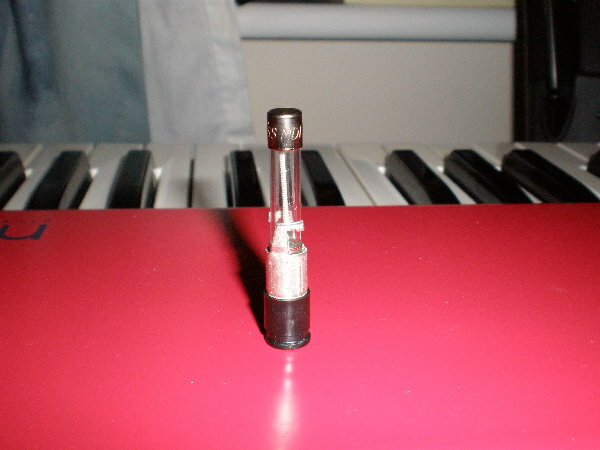 Back of keyboard showing fuse holder. 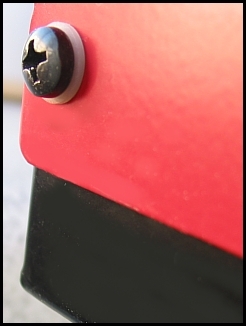 Locate the onboard switch beside the black plastic fuse-housing - see picture. Flick the switch from 115V to 230V! Couldn't be easier, and much respect to Clavia for including the voltage switch. This done, it's time to close up the case. I found it easiest to replace the 5 at the back first, followed by the 4 end screws, then tackle the underside. Now you have a complete Nord once again. Time to sort out your power cable. If you prefer using a U.S.-to-U.K. converter, simply plug in your cable and off you go! U.K. standard wiring - Brown = Live! Blue = Neutral. Green/Yellow = Earth. U.S. standard non-earthed wiring = Black = Live! White = Neutral. I thought somebody with a Nord Stage 76 or 88 would benefit from my discovery of how to change the voltage without a screwdriver. Thats right. I did not have to open the case. 1. Disconnect the power cord. 2. Purchase and install a new fuse appropriate for 230 volts. Its hard to find the correct fuses in Paris. The only store I found was Selectronic, a specialty electronic parts store on Place de la Nation. It cost 1 euro. 3. Cut a section from a stiff wire clothes hanger. 4. 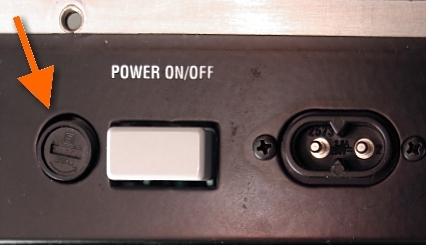 With a lamp held close to the top panel vents above the power supply, its reasonably easy to touch the sliding voltage selector and slide it to either setting. Be careful not to slip off the switch and hit another component! 5. Buy a new 2 pin power cable. I simply cut my USA pins off and installed a euro 2 pin end that fastens with screws. It cost me 0.87 centimes at Bricorama or BHV. There you go. I'm very glad not to carry a transformer around anymore! Well, it looks to me opening up the hood is much safer and more easier! Right, I agree opening up the hood is safer in that it allows better access. But I was worried there wouldn't be much slack in the wires underneath the controls going to the circuit boards, so if I made a bad move opening the case I might cause damage. Clavia says if you open the case, it voids the warranty. Have a look sometime at an NS76 or NS88. You really can see the whole power supply area through the vents. Its really not that hard if you have sure hands and good near vision. Slipping is only a problem (I think) if the hanger wire is too soft and springy. Having a little curve at the end helped me get behind the slider. The other thing that really is needed is a lamp shade so you can see inside and not be blinded. I think I might try inserting a battery an LED through the vent next time, so I'd sort of use the underside of the top panel as the lamp shade. I know this all sounds crazy, but I couldn't trust the repair shop here in Paris. It just looked too risky letting them open up my keyboard. By the looks of other clients gear piled to the ceiling, in various states of open/closed/ in progress, likely being ashed upon or espresso spilled on, and the threat of a gear avalanche with my board at the bottom seemed likely in the 7 days or so they would have had the NS in the shop. I just did this conversion on a Lead 1 rack I received from USA today. One thing that should be mentioned, is that the Lead 1 rack does not have an earthed chassis. In coutries with transformer isolated mains, this can be acceptable. However, it does not meet the Australian Standards for electrical appliances. Australia does not use transformer isolated mains, rather a three wire / single phase safety earth system. This is pretty common for synths which are sold worldwide. I will likely swap the two wire flex for a three wire, and connect the chassis to the safety earth. Most mains powered synths with metal enclosures should have the chassis earthed this way. On my G2X however, it is not so simple to earth, as it has a chassis mounted two pin power socket, rather than the grommet fitted flex used on the Lead 1 rack. Good good study, day day up! I can not speak for the Australian situation as I do not know about the rules there ... however, in the Netherlands we do not have transformer isolated mains and yet the two wire solution (without safety ground) chosen by Clavia is perfectly acceptable as long as the appliance is double isolated and not used in wet rooms (like showers, bathrooms). The Clavia gear that I own (Nord modulars) is double isolated (which is indicated by the double square symbol on the back, one square within another, on the voltage indication label). I think you mean to write double insulated which is different from isolation. The same rule applies for Australia. I think I didn't pay due attention here, not realising that it is double insulated throughout. I can't remember clearly how the internal wiring is run. I have a few other synths which are made in a similar fashion, which have only single insulation for the internal mains wiring, and had thought it a similar case. Probably it is fine. Sorry for the false alarm, and thanks for pointing this out. double insulated which is different from isolation. Yeah, that's what I guessed. Even in current English usage, the literal meanings of the two words are pretty close. Thank you everyone, and Wout in particular. Interestingly, when I asked Clavia tech support some years back about how to change the voltage, or having a tech repair person change the power supply, they said it couldn't be done. Keeping their hands clean from a legal perspective perhaps? ...Interestingly, when I asked Clavia tech support some years back about how to change the voltage, or having a tech repair person change the power supply, they said it couldn't be done. Keeping their hands clean from a legal perspective perhaps? Maybe you asked the wrong person? I need to buy 230V/125mA fuses for my future Nord Rack 3 (US model) and would like to know what are their size before placing an order? Are they "Ø5 x 20mm" ?? Have you succeed in finding the right parts? - 2x "Ø5 x 20 mm 125mA Time Lag Fuse (Slo-Blo®)"
- 2x "Ø6 x 32 mm 125mA Time Lag Fuse (Slo-Blo®)"
At least I'm sure one the two models will work! I've also ordered a Ø5 x 20 mm fuse holder + a Ø6 x 32 mm one so I'll have potential spare parts in case something funky happens. My mint US Nord Rack 3 came with a Ø6 x 32 mm 300mA (3/10A) slow blow fuse. So I replaced the 300mA with a 125mA model for 230V operation [Ø6 x 32 mm 125mA Time Lag Fuse (Slo-Blo®)]. Then switched the PSU to 230V... Did some cleaning and organization under the rack... And decided to add Zalman heat sinks to the 6 120MHz DSP chips... I'm thinking about adding 1 more (bigger) heat sink to the blue power transformer to help it cool down (adhesive thermal pad needed + heat sink needed). Finally, replaced the original power cord with a brand new one (IEC C7 connector/2 pin EURO) and powered up the Nord... Works!